Jose Muñoz drove the first automobile that came and traveled all over the streets of Cuba in December, 1898 he spent in Paris the years of the Hispanic-Cuban war. There he had witnessed the growth of this new means of transport and thought to make a good business with their sale in the island. The new car like others in their first years emitted a lowly noise of the ironwork not properly assembled and an explosive "taf taf". That first car made 12 kilometers per hour and cost six thousand francs, about one thousand pesos. 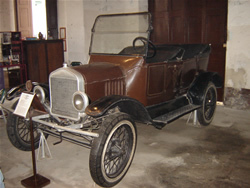 It belonged to one of the first brands of the new automobile industry of the La Parisiense factory. This, like other innovations, aroused the emulation spirit in the petite bourgeoisie of Havana. The pharmacist Ernesto Sarra who amassed one of the Cuban greatest fortunes that did not came exactly from the pharmacy, who did not take long to be the owner of the second automobile that crossed the narrow Havana avenues. It was not only the fact of having just another car. This came also from Paris, it was a Roche and Schneider, manufactured in Lyon with eight horsepowers, a considerable power for June1899. This cost 4 thousand pesos and reached 30 kilometers per hour. Those first cars were ridiculed when a horse at a good gallop exceeded them. Besides, Serrá still had the steering wheel at the rear and a drive belt that used to come off the running every six or seven blocks. Although he had to stop the car whenever this happened to put the drive belt in its place, the pharmacist was proud of being the owner of the most luxurious car of Havana because only competed with the above mentioned with less horsepowers. The third car in the country came as the result of one of the few business made by Mr. Muñoz. It was a small truck that Guardia and Company bought and could load up to half-ton of weight, very new at that time. This company used it to distribute the H Cabañas and Carvajal cigarettes that was a real show on board of that highly innovative small truck. Obviously, some American cars came later but they never surpassed the European cars in quality and number.